The cold is definitely back (as if it ever left?) to my corner of the world. Now is a good time to get back to the blanket! It’s been an ongoing project for the past year and a half and I believe now is the time to finish it! however, for some reason, the thought is not comforting. 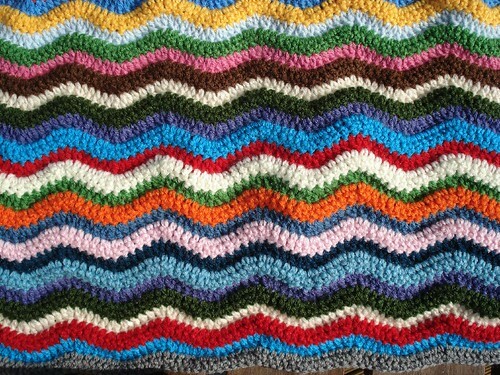 I enjoy marking the start of the cold with a return to the soft ripples of the blanket. I enjoy the peace and quiet it seems to surround the making of each line, as if I could leave the room and yet stay there and just enjoy things differently! A hidden pleasure, I tell you! I hear it’s not the same in Portugal, but winter has definitely arrived in the UK. 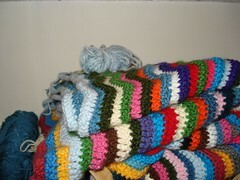 I’ve been crocheting a blanket for the past 8 months, preparing myself for the rigours of the British winter. It’s not finished yet and already it keeps me warm when I’m working on it. Again, time is a luxury I can’t afford, but… One needs to relax once in a while, watch a good series, drink tea and eat cookies… And as my Grandma used to say: watching TV is a good excuse to occupy your hands!